For those of you who have been wondering if I’ve been neglecting my garden during the early spring with all the running my husband and I have been doing, you’re right. I have neglected my garden, and as a result, the chipmunks are winning a battle I didn’t realize we were already fighting this season. When my husband and I came home from an out-of-town trip early this week, he went outside and stayed outside for a looooong time. When he came inside, he was steaming mad. Why? A beautiful camellia had tipped over, its roots eaten/disturbed by chipmunks tunneling around everywhere. I’m glad now that I photographed it when I did, because it may not survive the chipmunk wars to bloom another season. Its lovely blooms stayed well past a typical camellia season, probably because we’ve had a mostly chilly spring so far. 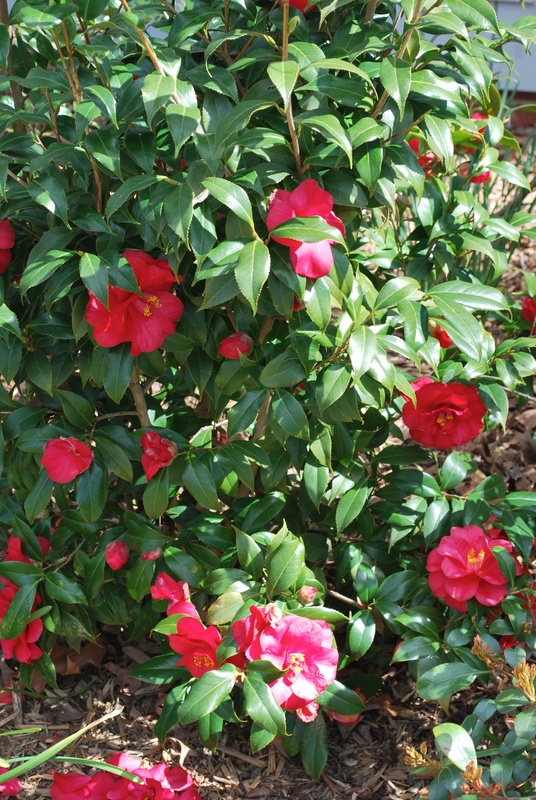 My husband propped the camellia back up, and he filled in around it with dirt and my usual arsenal against varmints: permatill (tiny rocks that act as a soil conditioner and supposedly also as a deterrent to burrowing rodents like chipmunks); holy moley (mole repellent that apparently does not repel chipmunks); more dirt and new mulch; and holly tone (fertilizer to strengthen the camellia). We have hope that our efforts will save the camellia, but it has already shed several yellow leaves, and the rest of the leaves look distressed. I’m not sure whether to cut it way back or leave it alone to see what parts may survive, if any. 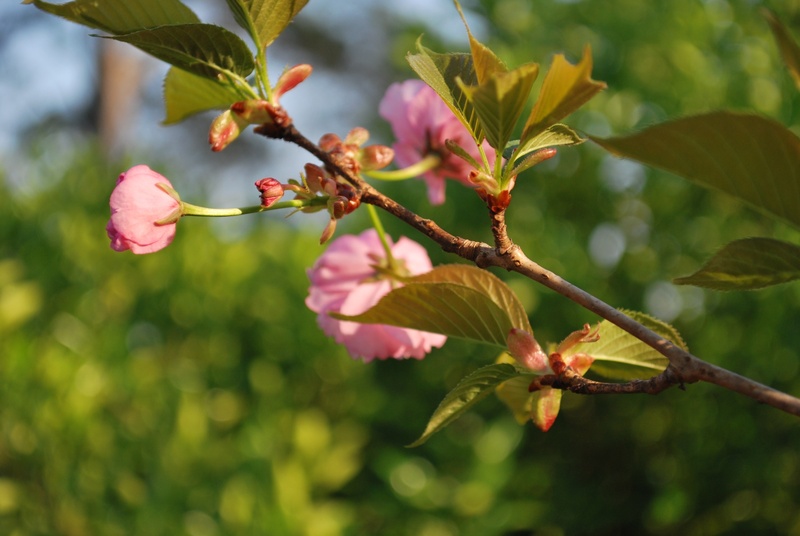 Master gardeners out there: I welcome your advice. I’ve spent the last few days weeding and planning next steps for the garden, all the while listening for blasted chipmunks to chirp their way past the red camellia. 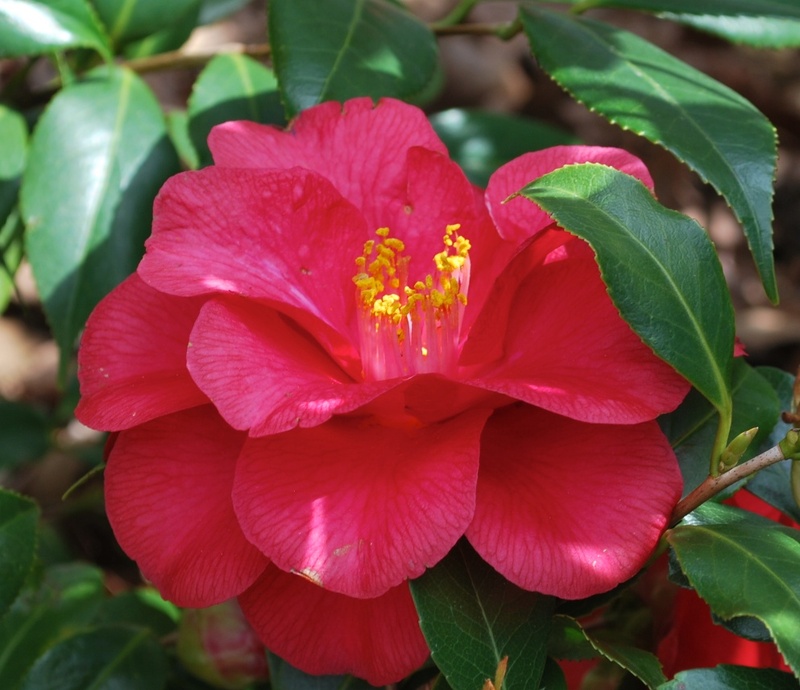 I’m also trying to figure out the best way to protect the other two camellias we have, along with a young susanqua that is a transplant from my mother’s garden. Heaven help the chipmunks if they go there. I’ve empathized much this week with Bill Murray’s character Carl from Caddyshack for his varied attempts to rid the golf course of gophers. I know we’re supposed to root for the gopher in the movie because it’s cute and fuzzy (and a puppet), but I really do feel sorry for Carl and the desperation that drives him to plant explosives in the gopher holes. As I’ve thought of crazy Carl this week, I also remembered that this isn’t the first camellia I’ve lost to varmints. Two years ago, I blogged about varmints and dead camellias and Carl. So I went back to find the post, and it reminded me of the reason spring is such a great season of hope. You see, I had written about a young cherry tree tipped over in a windstorm because something had eaten its roots. With the help of my dad, I got the tree staked, and then my husband added more dirt around the base of the tree. We hoped but didn’t know if it would survive. That summer was especially hard on the little tree, and the ends of the leaves withered in the heat because its roots weren’t fully recovered enough to protect it. And yet, it lived. It didn’t have any flowers on it last year, but it did leaf out. 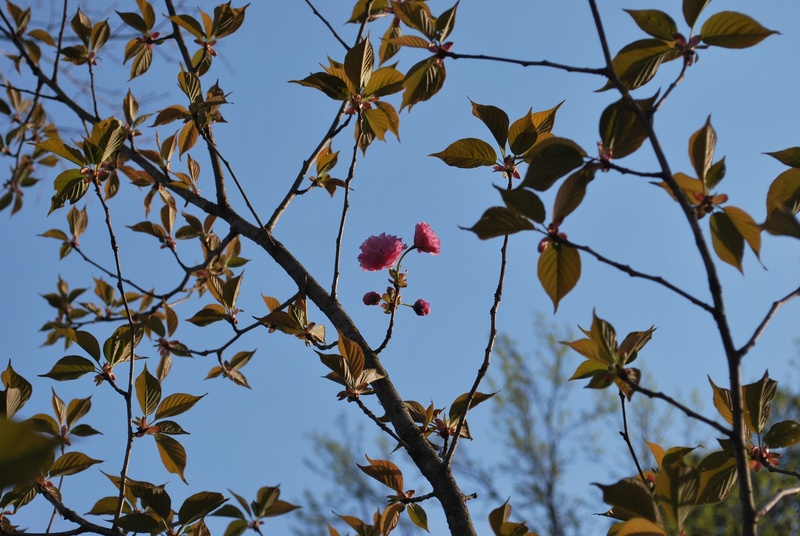 So maybe the little cherry tree was trying to offer me hope for the camellia, too, and the other plants that the chipmunks are killing or threatening with their mindless burrowing and eating and nesting. That gentle reminder to hope is one of my favorite parts of spring and one of my favorite aspects of gardening. After all, hope is the reason we gardeners plant and fertilize and weed. We hope our efforts will be rewarded: beautiful flowers, thriving vegetables, well-tended plants that come back year after year. You may not be a gardener, and you may not worry about chipmunks digging a maze of tunnels through your yard and garden, but perhaps this story will remind you to have hope in all things. 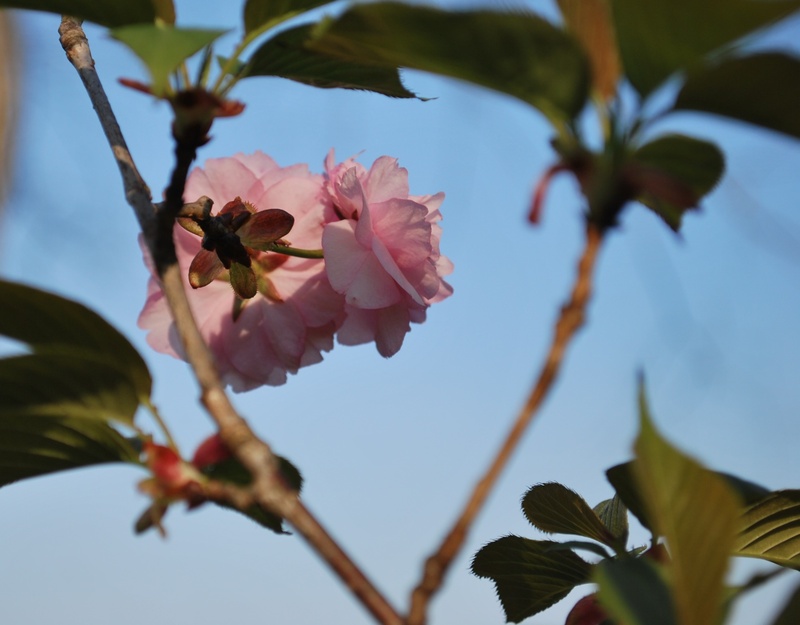 This entry was posted in flourishing tree and tagged camellias, cherry tree, chipmunks, faith, gardening, hope, Spring, trees by hopesquires. Bookmark the permalink. Loy — thanks for the advice. Unfortunately, I’m terribly allergic to cats. Some day, my husband would love to have a mostly outdoor cat, but we have to be at a point in life when he can be the one making the vet trips. I do love neighborhood cats, but our neighborhood doesn’t have nearly enough. Maybe I should start putting out cat snacks to attract them and see if they’ll return the favor with presents on my doorstep.